Picture a rocky surface trail in Colorado. Now imagine it in Missouri without the Colorado altitude. Well, that's how some GORC members see the Middle Fork. 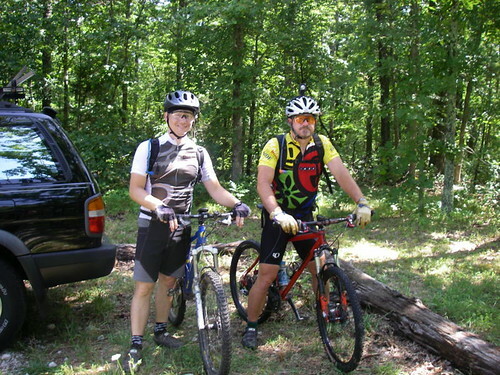 The newest section of the Ozark Trail was finished in Nov. 2005, and officially opened for use in April 2006. The trail is true Ozark terrain, constantly going up and down, over a hill then down into a valley, repeating the process over and over again for its entire length. The first 13 miles of the trail (it actually begins 1 mile north of the trailhead at the junction of DD/32), to Barton Fen has been open for over a year, and is already well established. In addition to the constant undulations, there are many creek crossings and a small side trail which takes you to a nice little waterfall. The Southern section begins with a bypass of the short foot-only stretch through Barton Fen. After following CR-79 (Neals Creek Rd. ), southeast for approximately 1.5 miles, the trail heads off to the right at the first road junction with CR-78. It's not very well marked here going north to south, and the connector is sometimes overgrown. This second section, approximately 10 miles in length, features fewer climbs than the first part, but they are longer and steeper. None are overly steep, they're just a constant grind getting over them. Fortunately, they come with the accompanying descents. You will be rewarded for your climbing efforts! There are fast downhills, sweeping banked turns, some open views of the countryside, and rockier technical miles. This section of the trail also has a few deeper water crossings which will probably require you to get your feet wet, so be prepared with extra socks. Always watch out for switchbacks, of which there are quite a number, some when you least expect it! 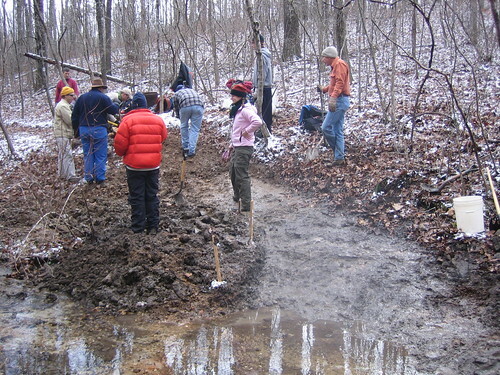 The trail tread is generally a mix of small rocks and hard-packed sandy soil, with softer spots near the creek crossings and through the several short clear cut areas. The trail holds up very well to water, and could probably be ridden even in the rain. Elevation ranges from around 1375' at the DD/32 trailhead to about 1000' at the southern trailhead at Highway J. At the northern end of the Middle Fork is the Trace Creek section of the Ozark Trail, and the Council Bluff trail and recreation area. 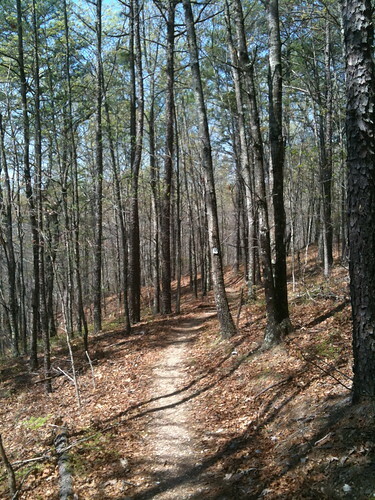 At the southern end is the Karkaghne section of the Ozark Trail. All are shared-use, open to foot, equestrian, and bicycle traffic. 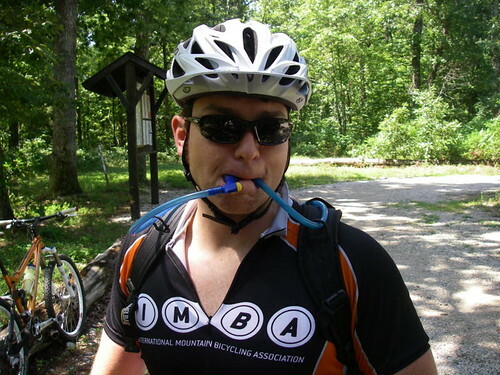 This combination of trails and quality camping makes the Council Bluff area ground zero for the adventurous mountain biker in Missouri. This trail can be made into a loop using gravel roads to make your way back. The Middle Fork itself is approximately 25 singletrack miles followed by an additional 13 miles of gravel road bringing the total ride length to 38 miles. It is advised that you take additional provisions and be sure to bring a copy of this map and directions. There are sections of long, steep grinders on the gravel back to the start. 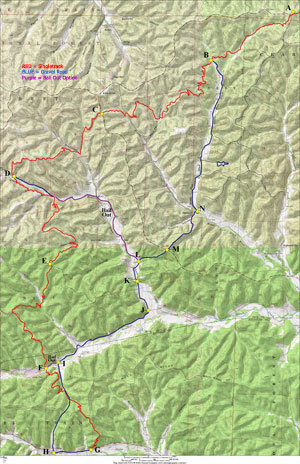 Also note that the last junction brings you back to the Middle Fork. Turn right onto the singletrack and ride about 3 miles back to the trailhead. Below are directions that are also labeled on the map. 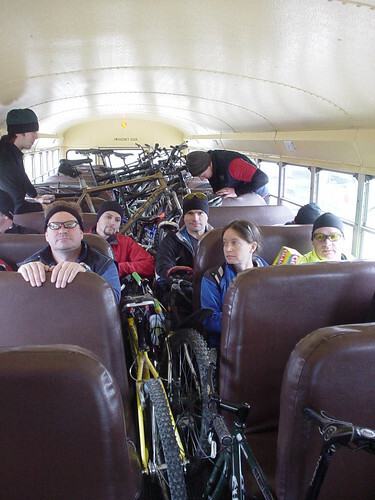 If you are interested in making the ride a point-to-point, it may be possible to arrange a shuttle from the Ozark Trail Association. Check out their website to find out about availability. You might also be interested in Brushy Creek Lodge; located off highway J near the Southern trailhead. By continuing across highway J onto the Karkaghne Section of the OT, you can ride directly to the Lodge on Brushy Creek's connector trail, (ask them for directions beforehand), or ride east along Hwy. J for a few miles. Brushy Creek has camping, hot showers, a swimming hole, and a restaurant which makes it a good location to start or end your ride. Northern Trailhead: MO 32 to intersection with DD just south of Council Bluff Recreation Area. There is parking about 100 yards north of the intersection on the eastern side of DD. Southern Trailhead: MO 49 to J intersection in Black, MO. Go west on J for about 8 miles. The trailhead is on the north side of J. There is a sign which indicates parking for the Ozark Trail on the south side of the road. 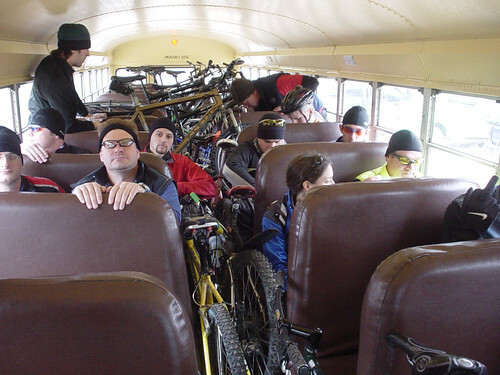 25 miles out-n-back / 38 miles if you do the "Middlefork Loop" - see below for more info. Rode from CB Lake to MF Junction, and first 13 miles of MF to Barton Fen - Tread all good, some leaves, some mud around creeks. Unfortunately dozens of trees down right now make the flow turn into sprints broken by dismounts. Bummed STL Trails are muddy? Enjoy some OT single track! Rode from DD/32 to HWY J and took roads back. There are about 10 walk over trees down, the creeks are deep, and raspberries are scratchy. Otherwise, G2G. DD/32 to Barton Fen and back. Excellent condition. 5-6 downed trees easily step overs. Leaf cover not bad at all. Water crossing at pretty low levels. Great Shape. Go get after it.